As the culmination of our physical and chemical change unit, my students had the chance to solve a problem. Their task? Create their own wrapping paper for a gift, using only objects found around the house. Their wrapping paper had to include both a physical and a chemical change. This group had an interesting design; they wanted to create rainbow paper. It was an excellent theory, and they worked hard to plan it out. Unfortunately, the product didn't turn out the way they expected. I was so proud of them for taking chances and making mistakes! Even though they took a chance that didn't work, they weren't discouraged, because both students re-did their challenge that night at home! This group contained two of my lower-proficient English learners. They had a trouble communicating their initial plan, partly due to a large language barrier. This group definitely "got messy!" Even though they struggled with the language, they were working together to create and solve a problem, which is what STEM is all about. Check out our wrapping paper! My kids were SO proud of what they created with food coloring and shaving cream. An administrator who walked by my room asked why the kids' projects didn't look like mine. This is probably a common question among people who aren't familiar with STEM, so here's what I said, and what you can say too. Simply put, A STEM challenge is not the same as a science experiment. An experiment has a desired and predictable outcome, based on a question or hypothesis, and follows a series of exact steps. 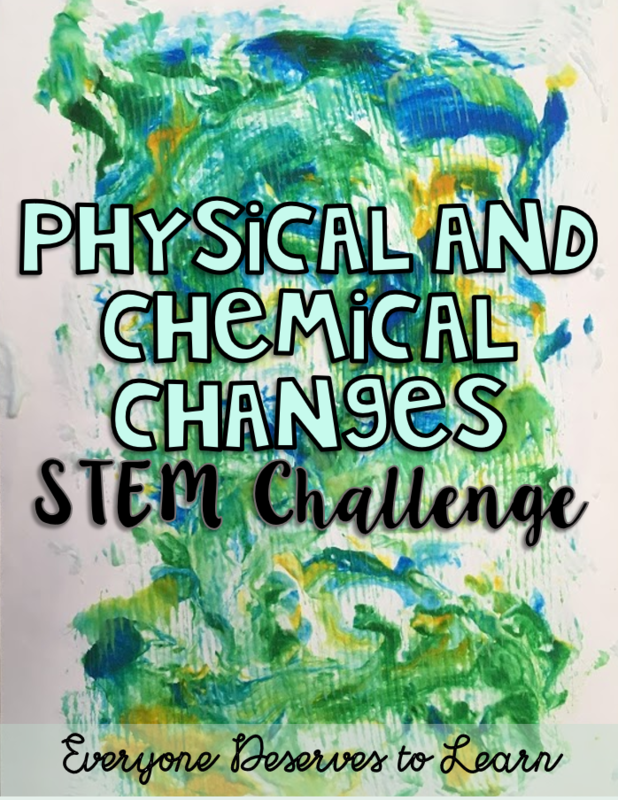 A STEM challenge has a desired outcome, but it is often not predictable, is based on solving a problem, and the steps are initiated by the students. Another analogy? STEM is to Miss Frizzle as experiments are to Bill Nye! Both are excellent and engaging in their own ways. 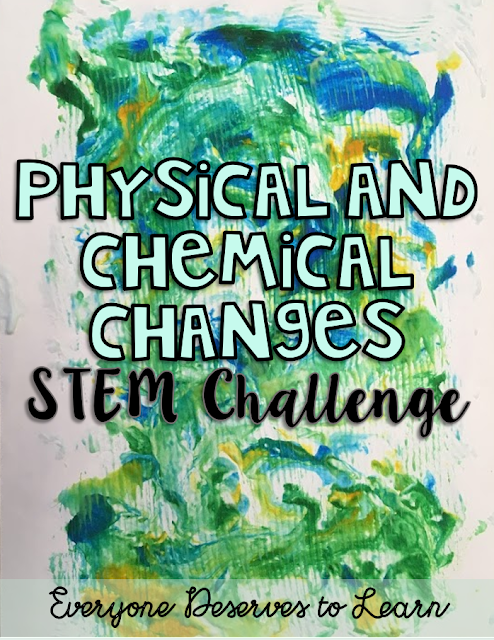 This Miss Frizzle style STEM challenge was lots of fun! In addition, it was as an assessment of my students' knowledge of physical and chemical changes in matter. The hands-on experience and usage of academic vocabulary in context created deep and enduring understanding of the content. Answering the questions on the "evaluate" part of their challenge sheet gave them the chance to practice writing in science, which is another difficult skill. STEM challenge for the win! 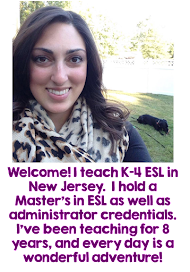 Do you do STEM challenges with your ELL's? My students are hooked and can't wait for the next one! I love holiday bulletin boards! There is just something extra special about them, especially when they share a warm message. I'm not sure how I'm going to top last year's caroler bulletin board, which is definitely one of my favorites. We started by making our carolers. My original template came from Elementary AMC, but I modified it to suit our bulletin board. If you'd like the tracers I used, click here! Students chose their face tone, hair color, scarf and sweater colors, and used a template to trace and cut. Click here for the templates! Meanwhile, I printed out the letters and glued them to cardstock. I chose to use "The best way to spread JOY and CHEER is singing loud for all to hear," instead of the traditional saying from the movie Elf, since we have many students who don't celebrate Christmas. This saying was more inclusive to all of our learners. I spaced out the letters and carolers in the hallway, and stapled them up. Extras that didn't fit were displayed on my door. The students and staff at my school LOVED this bulletin board, and I hope yours do too!